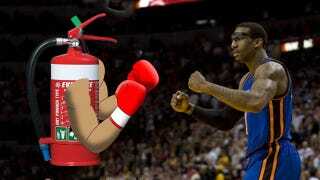 Knicks forward Amar'e Stoudemire was treated for a left hand laceration that resulted after punching the glass area that enclosed a fire extinguisher after tonight's loss to the Miami Heat. There is blood all over the carpet in the locker room. Isola described the scene as "complete chaos," and we can understand why. ESPN's Robert Flores said Stoudemire's hand was a "crimson mask." We're loath to go to the obvious "Amar'e finally figured out how to hit the glass" joke, especially since it's probably been done on Twitter 10,000 times by now, but we'll update this post when we get more information. Update (10:42 p.m.): Isola reports Stoudemire emerged from the locker room with his hand heavily taped and his arm in a sling. Update 3 (11:59 p.m.): Amar'e has apologized via Twitter.